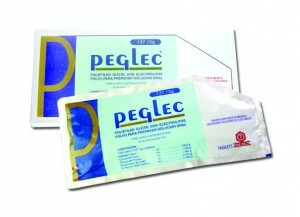 Peglec a unique combination of Polyethylene Glycol (PEG) with electrolytes for Gastro intestinal lavage. Peglec is a fast and effective way to cleanse your colon (intestines) before a colonoscopy. The first bowel movement should occur approximately 1 hour after the start of Peglec adminstration. Peglec is a prescription medicine for adults and children 6 months of age and older to use before they have a colonoscopy. Use of Peglec in children younger than 2 years of age should be closely monitored for occurrence of possible hypoglycemia. Peglec has proven safety in a wide range of patients, including elderly, diabetic, hypertensive, cardiac and renal patients as well as those with electrolyte imbalances. Peglec does not contain sodium phosphate, a type of salt found in some bowel preparations. FDA notified healthcare professionals and consumers of reports of acute phosphate nephropathy, a type of acute renal failure, that is a rare, but serious adverse event associated with the use of oral sodium phosphates (OSP) for bowel cleansing. Available in orange and pineapple flavors. A colonoscopy is an exam that a doctor—usually a gastroenterologist—performs to visually examine the inside of your colon. Colonoscopies are considered the gold standard for detecting abnormalities within the colon. One pack of Peglec must be dissolved in water completely to make 2 litres. Pour into a cup (approx. 200ml) the dissolved solution. Administer 5 cups in 1 hour. It is necessary that the total time take for consuming 2 litres of Peglec solution should not exceed 2 hours. The first bowel movement should occur approximately 1 hour after the start of Peglec administration. And then, as evacuation occurs several times, keep administering the remaining Peglec solution until rectal effluent is clear.